Schnauzers, Dachshunds, German Shepherd, Timeless Memories. Padding on silent paws, wolves are masters of their domain. Pausing at the forest's edge, they scan their environment with keen sight, hearing and scent. Now, you can capture the majestic beauty of the wolf in its wilderness terrain with the Silent Encounter Cuckoo Clock, a limited-edition wolf wall clock exclusively from The Bradford Exchange. Three noble wolves are depicted as realistic fully dimensional portraits on the base and top of this sculpted cuckoo clock. Intricately hand-sculpted and hand-painted for realism, they are held forever in time, captured in a perfect moment of wild beauty. The clock's body pays homage to vintage cuckoo clocks with its handsome "carved wood" appearance and the rich mahogany-colored finish that frames the clock face. A forest backdrop along with oak leaf and acorn accents add to the clock's rustic appeal. The Silent Encounter Cuckoo Clock is a fine, precision timepiece that boasts an accurate quartz movement. Elegant openwork hands, Roman numerals and filigree embellishments recall Bavarian traditions, as do the brass-toned pendulum and decorative pinecone weights. A sculpted cuckoo bird emerges with a chirp at the top of every hour for the perfect finishing touch. Strong demand is expected. So, don't waste any time; order now!! Nothing says country like a striking rooster art cuckoo clock hanging on your wall. Now, you can bring some country into your home with a rustic barn-style wood cuckoo clock featuring Rosemary Millette's prized rooster art, a limited edition exclusively from The Bradford Exchange.This charming Barnyard Strut Cuckoo Clock stands at more than one-and-a-half feet high and is custom-crafted with a real wood case, a hand-painted sculpted rooster topper, and decorative hanging pinecones. Rosemary Millette's rooster art decorates the front of this wall clock while a sculpted rooster appears on the hour with a cheerful crow. Plus, this precision timepiece features accurate quartz movement and a swinging brass-toned pendulum. Strong demand is expected, so order now! Time flies in the company of eagles! Experience the thrill and timeless majesty of bald eagles as never before with this first-ever limited-edition collectible cuckoo clock with bald eagle art by wildlife artist Ted Blaylock! You are sure to be inspired by this acclaimed artist's masterful portraits showcased on the clock face and body, each perfectly capturing the magnificent flight of eagles, soaring silently on enormous wings, gliding deftly between shimmering shafts of sunlight that caress harsh cliffs and snowy mountain peaks.The ideal collectible bald eagle gift or bald eagle decoration for your home, this elegant cuckoo clock is a Bradford Exchange exclusive. Handcrafted in the style of traditional cuckoo clocks with a solid wood cabinet and a rich walnut finish, it boasts amazingly intricate detailing in fine artist's resin, including fine sculptural leaf and tree designs, a handcrafted sculpted topper depicting an eagle in flight, and decorative pinecones hanging from golden chains. The clock face has elegant golden hour, minute and second hands, powered by a precise quartz movement, while a brass pendulum swings gently beneath. At the start of every hour a sculptural cuckoo emerges from miniature doors, serenading you with its distinctive call. This handcrafted wood cuckoo clock with bald eagle art is a treasure that promises inspiration till the end of time, but only if you hurry! Strong demand is expected, so order now! Showcase your love for the wilderness with a majestic representation of the beauty of wildlife and the great outdoors with the Moments of Majesty Cuckoo Clock, available in a limited edition exclusively from The Bradford Exchange. Capturing the peaceful atmosphere of the forest, this unique and handcrafted cuckoo clock is stunning eagle wall decor that adds a serene touch of nature to your home. This eagle wall decor is handcrafted in traditional cuckoo clock style. Beneath the clock face, a majestic hand-painted sculpted eagle and crashing waterfall bring a gorgeous wildlife scene to life. Topped by a fully-dimensional eagle sculpture with its impressive wings spread wide, this two-foot-high cuckoo clock is sure to be a treasured favorite. An elegant swinging metal pendulum and decorative pine cone weights add the perfect touch of wilderness. It is powered by a reliable quartz movement, and at the top of each hour, a traditional cuckoo emerges with a chirp. Strong demand is expected, so order now! Ever-so-playful and purr-fectly adorable, kittens make the most of every moment, and pounce on the fun in every hour. 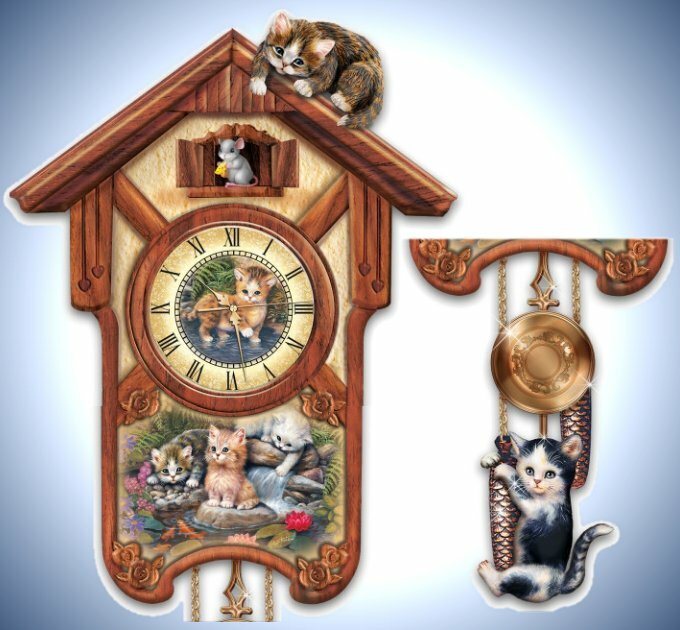 Now, the precious felines envisioned in the kitten artwork of internationally famed artist Jurgen Scholz inspire the charming Happy Trails Cuckoo Clock, a limited-edition custom design exclusively from The Bradford Exchange. With accurate quartz movement, Roman numerals, and graceful golden hands, you're sure to love this clock fur-ever!This handcrafted wall clock features a maple-finished wooden clock case with classic cuckoo clock styling, elegant rosette adornments, and a gleaming, brass-toned pendulum. An adorable sculpted, hand-painted tabby rests on the roof while heart-warming cat artwork by Jurgen Scholz graces the clock face and case front in full color. One sweet kitten adorns the dial and three more little charmers share a happy "tail" of a-mews-ing mischief outdoors below. For extra delight, a second sculpted kitty takes a thrill ride on the clock's pine cone weights that hang beneath. Plus, every hour, a sculpted, handcrafted mouse pops out from miniature doors at the top of the clock while musical tones chime. Strong demand is expected, so order now! Go "into the wild" with this nature-themed cuckoo clock. A majestic representation of the beauty of wildlife and the great outdoors, this Whitetail Gathering Cuckoo Clock is available in a limited edition exclusively from The Bradford Exchange. Capturing the lush atmosphere of the forest with its beautiful habitants, this unique cuckoo clock shall add an authentic touch of nature to your home.Get in touch with nature and the beautiful creatures that make up its habitat with this stunning wall clock. This cuckoo clock is handcrafted in traditional cuckoo clock style. The majestic sculpted deer and lush landscape is hand-painted to bring the serene scene to life. Adding the perfect finishing touch, the clock is topped by a fully-dimensional 10-point buck sculpture. An elegant swinging pendulum and decorative pine cone weights add to the overall environmental aesthetic. Powered by a reliable quartz movement and at the top of each hour, a traditional cuckoo emerges with a chirp. Strong demand is expected, so order now! From the dog days of summer through the bone-chilling days of winter, you can always count on your faithful black lab to be right by your side, making every moment of every day more wonderful. Now, let this Boisterous Black Labs Cuckoo Clock help celebrate the time you spend with your furry best friend with endearing black lab artwork by acclaimed award-winning artist Linda Picken, an impressively sized classic cuckoo clock design, and best-in-show features. A Bradford Exchange limited-edition exclusive, it's the perfect way to prove that time spent with good friends is never wasted.This black lab cuckoo clock boasts a masterfully crafted wooden clock body shaped like a quaint chalet. Sculpted artist's resin roses frame the main image: Linda Picken's heartwarming portrayal of two floppy-eared friends, expertly recreated in vivid color and detail. Another Labrador portrait adorns the clock face, along with Roman numerals and golden hands. A precision quartz movement and swinging pendulum flanked by decorative pine cone weights keep time ticking right along. Best of all, every hour a well-trained black lab "cuckoo" emerges from behind the shuttered doors at the top of the clock and treats you to a cheerful bark. Black Labrador retriever fans everywhere are sure to fall in love with this cuckoo clock, and strong demand is expected, so don't wait. Order now! On a warm spring morning or a crisp fall afternoon, every season is better with a loyal companion - especially when that companion is a sweet Yorkie! Now, let this lovable breed brighten every moment with the Youthful Yorkies Cuckoo Clock, a limited edition exclusively from The Bradford Exchange. This timely masterpiece by award-winning artist Linda Picken showcases not one, but two of her most beloved Yorkie portraits on a custom-crafted cuckoo clock. Best of all, at the top of every hour, the shuttered doors at the top swing open, and a miniature sculpted Yorkie "cuckoo" emerges with a cheerful bark!The endearing artistry of Linda Picken brings color and warmth to this cuckoo clock, which features an irresistible Yorkie portrait on the clock face and a second image of two Yorkies just below. Sculpted roses add traditional charm to the chalet-shaped wooden clock body, while a precision quartz movement, brass-toned pendulum and decorative pine cone weights keep the time with reliable accuracy. 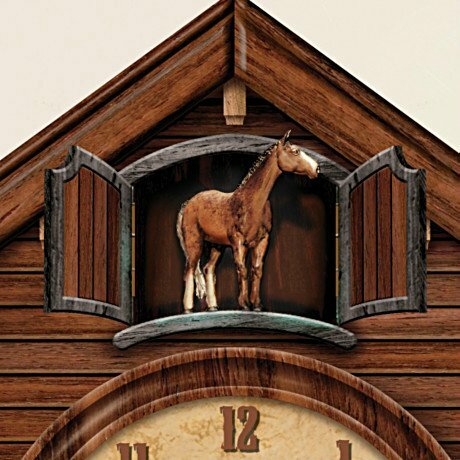 With so many best-in-show features to admire, the Youthful Yorkies Cuckoo Clock is sure to spark eager demand. So don't delay, order now! Time spent with friends is never wasted, especially when the friends are lovable golden retrievers! Now, four of the sweetest goldens you've ever seen grace this Gentle Golden Retrievers Cuckoo Clock. Available in a limited edition exclusively from The Bradford Exchange, this adorable golden retriever cuckoo clock showcases the endearing artwork of beloved award-winning artist Linda Picken. Her most engaging golden retriever portraits are showcased on this custom-crafted cuckoo clock. The wooden chalet-style body of the cuckoo clock is filled with champion-quality features you're sure to admire for hours on end. Sculpted artist's resin roses frame the featured images of two beautiful goldens.Another portrait of a golden retriever graces the center of the clock's face while Roman numerals and golden hands mark the hours, minutes and seconds. A precision quartz movement and swinging pendulum, flanked by decorative pine cone weights, lets you always know when its time to sit, stay or go and play with your furry four-legged friends. Best of all, a well-trained golden retriever puppy emerges from behind the shuttered doors with a cheerful bark to announce every hour. Strong demand is expected for this heartwarming Linda Picken golden retriever cuckoo clock. So, don't waste another second; order now! Time spent with friends is never wasted, especially when it's spent with lovable pug friends! Now, welcome into your home some of the rolly-polliest pugs you've ever seen with Playful Pugs Cuckoo Clock, a limited edition available exclusively from The Bradford Exchange. Showcasing the endearing pug artwork of beloved award-winning artist Linda Picken, this custom-crafted cuckoo clock is inspired by traditional design and is shaped like a charming chalet and filled with best-in-show features you're sure to admire time and again.Not one, but two of Linda Picken's most engaging pug portraits are featured on this timely pug tribute! Sculpted roses adorn the main image of two adorable and energetic canine companions. A second, full-length portrait of a pug serves as the centerpiece of the cuckoo clock face, which also features Roman numerals and golden hands. The precise quartz movement and swinging brass-toned pendulum, flanked by decorative pine cone weights make sure you always know when it's time to sit, stay or go. Best of all, a sculptural pug "cuckoo" emerges from behind the shuttered doors on the hour with a cheerful bark! Strong demand is expected, so don't wait. Order now! Anyone who has spent time with a Pomeranian knows that each is a paws-atively precious bundle of love who makes every minute memorable! Now, celebrate the Pomeranian you love with this Pretty Pomeranians Cuckoo Clock. A Bradford Exchange limited-edition exclusive, it features irresistible Pomeranian artwork by acclaimed award-winning artist Linda Picken, showcased within an impressively sized classic cuckoo clock design and highlighted by best-in-show features. It's the perfect way to prove that every minute you spend with your best furry friend is time well spent.With its masterfully crafted chalet-style wooden clock body, this cuckoo clock is the perfect showcase for the irresistible charm of Pomeranians. Sculpted artist's resin roses frame the main image of two adorable Pomeranian pals by Linda Picken, expertly recreated in rich color and detail. Another Pomeranian portrait adorns the clock face, along with Roman numerals and golden hands. A precision quartz movement and swinging pendulum flanked by decorative pine cone weights keep time ticking right along. Best of all, every hour a well-trained Pomeranian "cuckoo" emerges from behind the shuttered doors at the top of the clock and greets you to a cheerful bark. Pomeranian fans everywhere are sure to fall in love with this cuckoo clock, and strong demand is anticipated, so hurry. Order now! Schnauzer fans know, spending time with a lovable schnauzer pal makes every minute a treasure! Now you can make all those special times together even more memorable with this Sweet Schnauzers Cuckoo Clock. A Bradford Exchange limited-edition exclusive, it boasts paws-atively perfect schnauzer artwork by acclaimed award-winning artist Linda Picken, showcased within an impressively sized classic cuckoo clock design and highlighted by best-in-show features. What a wonderful way to prove that time spent with your best furry friend is never wasted.This schnauzer cuckoo clock is sure to charm one and all with its masterfully crafted chalet-style wooden clock body. Sculpted artist's resin roses frame the main image of two perky schnauzer pals by Linda Picken, expertly recreated in vibrant color and detail. Another schnauzer portrait adorns the clock face, along with Roman numerals and golden hands. A precision quartz movement and swinging pendulum flanked by decorative pine cone weights keep time ticking right along. PLUS, every hour a well-trained schnauzer "cuckoo" emerges from behind the shuttered doors at the top of the clock and greets you to a happy bark. Schnauzer fans everywhere are sure to fall in love with this cuckoo clock, and strong demand is anticipated, so hurry. Order now! From the dog days of summer through the bone-chilling days of winter, every moment of the year is better when it's spent with friends - lovable Dachshund friends, that is! Now, four of the cutest Doxies you've ever seen are ready to scamper into your home and heart courtesy of the Delightful Dachshunds Cuckoo Clock, a limited edition available exclusively from The Bradford Exchange. This timekeeping treasure showcases the endearing artwork of acclaimed award-winning artist Linda Picken with not one, but two of her most engaging portraits of this top-ten breed on a custom-crafted cuckoo clock inspired by traditional designs. The wooden body of this masterfully crafted dachshunds cuckoo clock is shaped like a charming chalet and filled with best-in-show features you're sure to admire time and again.Sculpted roses adorn the main image of three floppy-eared friends. A second, full-length portrait of a dachshund serves as the centerpiece of the cuckoo clock face, which also features Roman numerals and golden hands. The precise quartz movement and swinging brass-toned pendulum, flanked by decorative pine cone weights, keep time ticking right along and make sure you always know when it's time to sit, stay or go. But, perhaps the best feature of all is the hourly entertainment provided by a well-trained dachshund "cuckoo" who emerges from behind the shuttered doors on the hour with a cheerful bark! Strong demand is expected from dachshund lovers everywhere. So don't waste time; order now! From the dog days of summer through the bone-chilling days of winter, every moment of the year is better when it's spent with friends - lovable German Shepherd friends, that is! Now, four of the most beautiful Shepherds you'll ever see are ready to bolt into your home and heart courtesy of the German Shepherd Cuckoo Clock, a limited edition featuring the beloved artwork of renowned artist Linda Picken, exclusively from The Bradford Exchange. Inspired by traditional designs, the masterfully custom-crafted wooden clock body is shaped like a quaint chalet. The front panel showcases two of Ms. Picken's most engaging portraits of this top-ten breed while the rest of this grand-looking clock is filled with best-in-show features you're sure to admire time and again. Sculpted artist's resin roses frame the main image of two attentive friends, with another full-length portrait of an adorable German Shepherd puppy on the clock's face. Roman numerals and golden hands mark the time while a precise quartz movement and swinging pendulum, flanked by decorative pine cone weights, keep time ticking right along, making sure you always know when it's time to sit, stay or play. Perhaps best part of all, a well-trained German Shepherd "cuckoo" emerges from behind the shuttered doors with a cheerful bark to announce every hour! German Shepherd lovers everywhere are sure to be delighted by this exceptional wall clock and strong demand is expected. So don't waste any time; order now! Fill each hour with charming beauty and a cheerful song when you display this first-ever limited-edition Thomas Kinkade cuckoo clock! A Bradford Exchange exclusive, this extraordinary timepiece is graced by two of Mr. Kinkade's most highly sought artistic visions - the traditional maple-finished wood cabinet showcases "A New Day Dawning," while "Everett's Cottage" enhances the clock face.Details handcrafted in artist's resin add even more charm to this wall cuckoo clock, including rosette adornments and decorative hanging pinecones. Best of all, at the beginning of each hour the tiny door at the top opens and a hand-painted sculptural cardinal emerges, chirping a cheerful melody! The timepiece itself is superbly crafted with accurate quartz movement, golden hands, and a swinging brass pendulum, creating a unique home decor collectible you'll be thrilled to display in any room! Intense demand is expected for this first-of-its-kind treasure, so don't delay! Order now!